Biblical References: Solomon's House and Temple—Palace of Ahashuerus. Assyrian Furniture: Nimrod's Palace—Mr. George Smith quoted. Egyptian Furniture: Specimens in the British Museum—The Workman's Stool—Various articles of Domestic Furniture—Dr. Birch quoted. Greek Furniture: The Bas Reliefs in the British Museum— The Chest of Cypselus—Laws and Customs of the Greeks—House of Alcibiades—Plutarch quoted. Roman Furniture: Position of Rome— The Roman House—Cicero's Table—Thyine Wood—Customs of wealthy Romans—Downfall of the Empire. Period of 1000 years from Fall of Rome, A.D. 476, to Capture of Constantinople, 1453—The Crusades—Influence of Christianity— Chairs of St. Peter and Maximian at Rome, Ravenna and Venice— Edict of Leo III. prohibiting Image worship—The Rise of Venice— Charlemagne and his successors—The Chair of Dagobert—Byzantine character of Furniture—Norwegian carving—Russian and Scandinavian—The Anglo-Saxons—Sir Walter Scott quoted— Descriptions of Anglo-Saxon Houses and Customs—Art in Flemish Cities—Gothic Architecture—The Coronation Chair in Westminster Abbey—Penshurst—French Furniture in the 14th Century— Description of rooms—The South Kensington Museum—Transition from Gothic to Renaissance—German carved work: the Credence, the Buffet, and Dressoir. IV.—Louis XIII. Furniture—Brittany woodwork. The Renaissance in the Netherlands: Influence of the House of Burgundy on Art—The Chimney-piece at Bruges, and other casts of specimens in South Kensington Museum. The Renaissance in Spain: The resources of Spain in the sixteenth and seventeenth centuries—Influence of Saracenic Art—High-backed leather chairs—The Carthusian Convent at Granada. The Renaissance in Germany: Albrecht Dürer—Famous Steel Chair of Augsburg—German seventeenth century carving in St. Saviour's Hospital. The Renaissance in England: Influence of Foreign Artists in the time of Henry VIII.—End of Feudalism—Hampton Court Palace—Linen pattern Panels—Woodwork in the Henry VII. Chapel at Westminster Abbey—Livery Cupboards at Hengrave—Harrison quoted—The "parler"—Alteration in English customs—Chairs of the sixteenth century—Coverings and Cushions of the time, extract from old Inventory—South Kensington Cabinet—Elizabethan Mirror at Goodrich Court—Shaw's "Ancient Furniture"—The Glastonbury Chair—Introduction of Frames into England—Characteristics of Native Woodwork—Famous Country Mansions—Alteration in design of Woodwork and Furniture—Panelled Rooms in South Kensington— The Charterhouse—Gray's Inn Hall and Middle Temple—The Hall of the Carpenters' Company—The Great Bed of Ware—Shakespeare's Chair—Penshurst Place. English Home Life in the Reign of James I.—Sir Henry Wootton quoted—Inigo Jones and his work—Ford Castle—Chimney Pieces in South Kensington Museum—Table in the Carpenters' Hall—Hall of the Barbers' Company—The Charterhouse—Time of Charles I.—Furniture at Knole—Eagle House, Wimbledon—Mr. Charles Eastlake— Monuments at Canterbury and Westminster—Settles, Couches, and Chairs of the Stuart period—Sir Paul Pindar's House—Cromwellian Furniture—The Restoration—Indo-Portuguese Furniture—Hampton Court Palace—Evelyn's description—The Great Fire of London—Hall of the Brewers' Company—Oak Panelling of the time—Grinling Gibbons and his work—The Edict of Nantes—Silver Furniture at Knole—William III. and Dutch influence—Queen Anne—Sideboards, Bureaus, and Grandfather's Clocks—Furniture at Hampton Court. Collections—Processes of making Lacquer—Screens in the Kensington Museum. Japanese Furniture: Early History—Sir Rutherford Alcock and Lord Elgin—The Collection of the Shogun—Famous Collections— Action of the present Government of Japan—Special characteristics. Indian Furniture: Early European influence—Furniture of the Moguls—Racinet's Work—Bombay Furniture—Ivory Chairs and Table—Specimens in the India Museum. Persian Woodwork: Collection of Objets d'Art formed by Gen. Murdoch Smith, R.E.— industrial Arts of the Persians—Arab influence—South Kensington specimens. SARACENIC WOODWORK: Oriental customs—Specimens in the South Kensington Museum of Arab Work—M. d'Aveune's Work. Palace of Versailles "Grand" and "Petit Trianon"—The three Styles of Louis XIV., XV., and XVI.—Colbert and Lebrun—André Charles Boule and his Work—Carved and Gilt Furniture—The Regency and its Influence—Alteration in Condition of French Society—Watteau, Lancret, and Boucher. Louis XV. 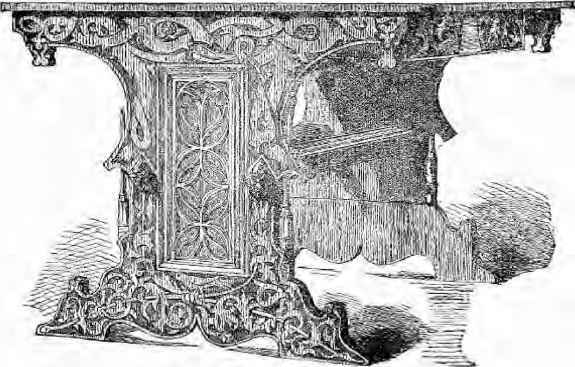 Furniture: Famous Ébenistes— Vernis Martin Furniture—Caffieri and Gouthière Mountings—Sêvres Porcelain introduced into Cabinets—Gobelins Tapestry—The "Bureau du Roi." Louis XVI. and Marie Antoinette: The Queen's Influence— The Painters Chardin and Greuze—More simple Designs— Characteristic Ornaments of Louis XVI. Furniture—Riesener's Work— Gouthière's Mountings—Specimens in the Louvre—The Hamilton Palace Sale—French influence upon the design of Furniture in other countries—The Jones Collection—Extract from "The Times". Chinese style—Sir William Chambers—The Brothers Adams' work— Pergolesi, Cipriani, and Angelica Kauffmann—Architects of the time— Wedgwood and Flaxman—Chippendale's Work and his Contemporaries—Chair in the Barbers' Hall—Lock, Shearer, Hepplewhite; Ince, Mayhew, Sheraton—Introduction of Satinwood and Mahogany—Gillows, of Lancaster and London—History of the Sideboard—The Dining Room—Furniture of the time. The French Revolution and First Empire—Influence on design of Napoleon's Campaigns—The Cabinet presented to Marie Louise— Dutch Furniture of the time—English Furniture—Sheraton's later work—Thomas Hope, architect—George Smith's designs—Fashion during the Regency—Gothic revival—Seddon's Furniture—Other Makers—Influence on design of the Restoration in France—Furniture of William IV. and early part of Queen Victoria's reign—Baroque and Rococo styles—The panelling of rooms, dado, and skirting—The Art Union—The Society of Arts—Sir Charles Barry and the new Palace of Westminster—Pugin's designs—Auction Prices of Furniture— Christie's—The London Club Houses—Steam—Different Trade Customs—Exhibitions in France and England—Harry Rogers' work— The Queen's cradle—State of Art in England during first part of present reign—Continental designs—Italian carving—Cabinet work— General remarks. The Great Exhibition: Exhibitors and contemporary Cabinet Makers—Exhibition of 1862, London; 1867, Paris; and subsequently—Description of Illustrations—Fourdinois, Wright and Mansfield—The South Kensington Museum—Revival of Marquetry— Comparison of Present Day with that of a Hundred Years ago— ^stheticism—Traditions—Trades-Unionism—The Arts and Crafts Exhibition Society—Independence of Furniture—Present Fashions— Writers on Design—Modern Furniture in other Countries—Concluding Remarks. List of Artists and Manufacturers of Furniture—Woods—Tapestry used for French Furniture—The processes of Gilding and Polishing— The Pianoforte.